We have seen a few more Mahi-Mahi on our Ft. Lauderdale fishing charters as yet another frontal system has moved through our South Florida area. As these fronts pass the winds swing to the east and those easterly winds have brought some Mahi-Mahi nearer to shore and the reefs which is good news for us. No big numbers of these fish but we are catching them. The baitfish along the reefs are attracting their attention and holding them near shore, that being within 2 miles of the beach. 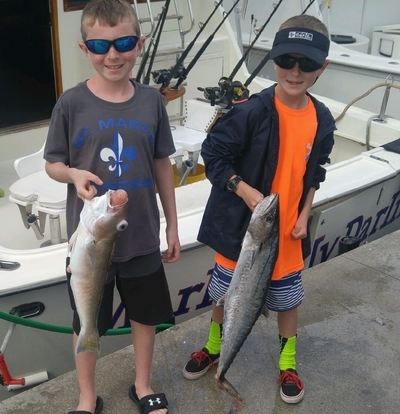 The Kingfish continue to bite well most days but again they are small school sized fish and there are a good number of throwbacks as they are under sized. We are catching them on our braided line planer rods and Bonito strips have been best. An occasional full grown Bonito while doing this also. Again some Blackfins and more so the Skipjack Tunas off the edge. There continue to be some Sailfish as expected and an occasional Wahoo as well. We see both species while trolling but we are trending toward more live baiting when the Sailfish are atop the wish list. Be prepared to sit awhile waiting for that bite.This time of year we see some smaller ones but a fully grown fish is often the one taking a bait. We had been fishing in a south current for several days but that has changed and the north current has returned and is moderate at best. Happy to see it. Early Winter last year produced some really nice Mahi-Mahi on south currents but we very much prefer that northerly flow. Plenty of sun for those fleeing the weather up north. Thursday they are calling for a high of 85. A bit warm for us here as we have enjoyed the cooler weather, but probably heavenly for visitors from the north. As we mentioned the wind is now from the east and is in the low teens and the forecast is for that eastern flow to continue for the next several days. That is good news as we like an east wind . NE, SE or due East is just fine by us as a still day can make for great boating but difficult fishing.